See the difference? In the passive voice example, the Martian receives the greeting. In the active voice example, the astronaut delivers the greeting. Passive voice is often indicated by the phrase “by the” and the subject will often be followed by a form of the verb “be” (e.g., is, was, are, am, and been). However, this is not concrete evidence the sentence is passive. Passive voice is less direct whereas active voice is direct. Passive: A letter is secretly mailed by the old man. Active: The old man secretly mails a letter. Passive voice lacks brevity whereas active voice is concise. Passive: Mimes are loved by audiences. Passive voice is confusing and misleading, whereas active voice is clear and transparent. Passive: Many rovers had been repaired by Martians long before Earth landed on the moon. Active: Martians have been repairing rovers long before Earth landed on the moon. Passive voice will occasionally leave out who or what performed the action, whereas active voice clearly designates someone or something performed the action. Passive: The bowl was stolen between 3:00 and 3:30. Active: Someone stole the bowl between 3:00 and 3:30. Which voice should you ultimately use in your articles? Due to the complexity of the sentence’s construction, passive voice can often be too confusing for general audiences. Alternately, active voice can often be considered too abrupt for sensitive topics. Consider how you would handle the subject if you were face-to-face with your audience. Choosing between active and passive voice entirely depends on the subject you want to emphasize. In any of the examples above, the subject is the star of the sentence. Passive: While on Mars, the space-walking Martian was waved to by the astronaut. Active: While on Mars, the astronaut waved to the space-walking Martian. By pointedly leading with the “star subject,” you can manipulate how readers understand an event or idea. In both examples, the same action occurs: waving. However, in the passive sentence, the star subject is the space-walking Martian; in the active example, our star subject is the astronaut. An article featuring Martians as protagonists would likely use the passive version. An article featuring astronauts as protagonists would likely use the active version. All in all, if you’re looking for concision and better understanding, aim for active voice. Alternately, if you need to tone down your writing, a little strategically placed passive voice won’t hurt. Just remember this last tip: An active subject performs an action and a passive subject receives an action. Loved your article. Thanks again Dear Penny for posting this great article. Great explanation of a difficult topic! Thanks. I appreciate. Only expert journalists and editors can consciously do this creatively. I generally stick with an active voice. I learned this from my boss at my old computer job. Passive voice has its place in articles, but primarily, i think you should use an active voice to make your point, and to get it understood right away. The list may go on like Poets, Lyrist, Authors but sometimes great Bloggers to possess creativity. The part about which subject is the star subject depending on the active or passive treatment is very helpful to me. Now I know how to keep my writing focused on the star subject consistently throughout the piece no matter how long it is. And I can shift as needed as well. I like that a lot. Thanks. You are welcome, Terry Chestnutt, let me know how you enjoy it! Thank you for clarifying. And thank you for all of the lessons. Many writers don’t realize their own style until someone points out something like this subject on active or passive voice and then we reflect. I confess that since I read Stephen King’s book On Writing I try not to use the passive voice because he says it’s bad, bad, bad and who would argue with a man that prolific! I was struck by your recommendation of On Writing by Stephen King and ordered a copy from the local library. He would certainly be the one to learn from. Thanks. The ‘voice of choice’ in government policy writing has traditionally been passive. I sadly became fluent in those constructions. It is heartening now to see that plain and clear communication is the goal. Active voice clearly serves that purpose well in delivering instructions, defining eligibility and explaining complex issues. When in doubt, read it out – to yourself of course. Be your own best ‘audient’ -isn’t that the singular of ‘audience’ – only joking! It’s great Penny. I agree with you. It depends on the context whether we use active or passive voice. 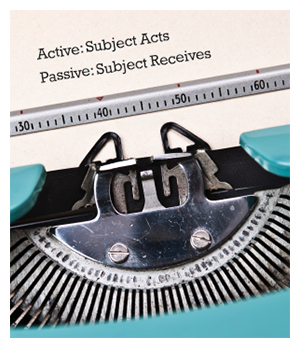 I never thought about active versus passive until we started using EzineArticles. The spell/grammar checker pointed out the passive voices. At first it was simply frustrating, however, the sentences made more sense with the active voice. We outsource our article writing and I spend a fair amount of time on each article to rework passive into active. It definitely reads better in the active voice. We have found 1 in 10 writers who understand the difference. We forget to apply all these, even if we are aware of them to the full. This blog is a great reminder for me. Thank you very much. Great illustration and made easy for a huge difficulty subjet for non-mother english speaker! It is dificult for me to write in the active voice since I write a lot of contracts and they are mostly in passive voice. I think most legal stuff is in passive voice. ..or any such a “sensitive” subject, such as parents dealing with children having physical deformities…then “passive voice” would almost certainly be a “softer tone” and come off as less abrupt. So to me “passive voice” has a place, I simply have yet to write a piece which called for its use. That really hits me as a very good suggestion, Stephen Monday. Thanks much. I think that each an every one of them: passive and active voice have its day. But, teachers should make use of passive voice, to enable their subjects grab the message, while when it comes to writing, we adhere to active voice: to avoid many mistakes and the burden of over strength, waste of time, resources etc. Thanks, this is a good pointer at the right time and at the right direction and to the rightful people in deer of it. Passive voice is used for official, legal and scientific documents. Applied in the usual way, this distances the author from the product, which disconnects the person writing from the work. It comes across as impersonal and dispassionate, in other words. It also allows great structural precision, while allowing (in English, that language of endless near-but-not-quite synonyms), a useful ambiguity on sensitive issues. You can see why all this is useful, and why it is a requirement for these kinds of document. Active voice is personal and immediate, by contrast. It attracts, appeals to the emotions and persuades – which is usually the aim of EzineArticles authors. It also opens the author to a vulnerability of judgement and accusation by detractors. And that is why Penny advises dropping into the passive voice over sensitive issues where an author doesn’t want to be seen as strident. So that’s why good persuasive authors write in active voice, but instinctively drop into passive at certain points. Agree completely with your passive voice description. When reading posts on some of the “Authority” sites I often get bored with the impersonal oblique information presented in the passive voice. Sometimes necessary, but still long winded and boring! Thank you Penny, so exciting to read your new article! Superb content, Penny. You are truly a literary teacher. Your article helped me greatly, thank you. I was helped greatly by your article, thank you. Thanks so much for the reminder. As a former English teacher sometimes I forget my own rules when I’m writing for business. Since you put this post up, I have read 10+ books on grammar and writing. I realized that my writing was very bad. For many years I was a CEO and my assistants put all my dictation in proper form. When I looked at my recent writing (without an assistant), it looks like I have forgotten all the grammar that I ever learned. Pathetic. Does anyone know of a spell checker that check for passive voice similar to EzineArticles’ checker? Microsoft’s Word has had a good grammar checker (which they bought in!) for the last 15 years. Office Button (top left of the window) > Word Options (bottom of the dialog box) > Proofing; then look down this long list for “When correcting spelling and grammar” and click ‘settings’ opposite ‘writing style’. You can then set and unset the options you want the checker to look for in both grammar and style – plenty to choose from! I have been using a 2003 edition of MSWord. I loaded a 2007 version and get the same results. I didn’t see any new parameters to select. There is not a need to upgrade from 2003 to 2007 or later. I does a lot of what we need for preparation for EzineArticles submission, but always have more to do when we grammar check using EzineArticles’ checker. Hi, Mary. I don’t think the checker in Word has changed a lot since they bought licence to ‘Grammatik 5’ in 1996. So, you’re right – they should be the same at default setting. The earlier ‘models’ gave you less choices, though. If I recall right, you could mostly choose between a ‘formal, a ‘technical’ and a ‘casual’ style, plus tick some other tweaks. Now you get to set all the bits of these at your option. And one of the options is the ‘passive voice’ that this post is all about. Remember, though, that the checker will only offer you choices – it highlights places to check whether it’s what you want; it speeds up editing and proofreading, in other words. The spellchecker just looks for words on its list, so homonyms like ‘which’ and ‘witch’ are each passed as OK wherever they occur grammatically; so are ‘to’, ‘too’ and ‘two’; and ‘you’, ‘yew’ and ‘ewe’. It’s the grammar and style checker that tries to see whether you’ve used words and constructions ‘properly’ for your purpose – and you can set that to your own taste. Some will always escape, of course. Typos like ‘tip’ for ‘top’ are easy to miskey and no checker is likely to spot and highlight all such slips in the foreseeable future. In the end you, the author, get to choose – and to be judged by that choice. That’s the bottom line! I couldn’t find the formal, casual or technical options. It might be available after the 2007 version. I switched to the 2007 version and it seems better than my old 2003 version. You are exactly correct about the spell and grammar checking still requires proof reading. I do that paragraph as I fix the errors that get detected. The passive voice is much weaker than the active voice. Hopefully we will see improved results as compared to old articles which were heavily passive. I don’t think Ezine started passive checking a while ago, otherwise we should have run into this issue before. Anyway, thanks for the help. A very helpful blog. Mary, these ‘group’ options were on really old Word versions – like Word97 itself, and maybe Word2000 (and on WordPerfect, if you remember that?). I think that the current multiple choice system replaced these ‘styles’ by Word2003, which I haven’t used. I definitely agree, esicepally with some of your points:1. Manage your expectations. While it is possible to make a lot of money online , work on building relationships.2. Offer a range of products.3. Always offer more quality than the price you are askingThanks for the reminders. Pretty useful article. I am not too sure the main use of the passive voice has been properly described. From my understanding the passive is often used in scientific papers and Standard Operating Procedures. It can of course be generally useful in less formal narratives as described in the article – “was he cheated or or what!?”. In this case another factor of the passive is when we do not know the ‘actor’. “Last week I was robbed.”.